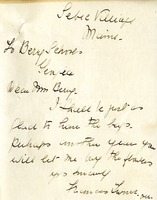 This is a bill for 6 napkins to match a lavender luncheon set sent to Mrs. Henry Rauh. 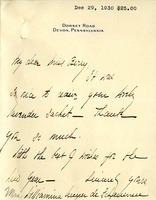 Grace Dodge thanks Martha Berry for the gift she has received. Mrs. Bestor thanks Miss Berry for the homemade candy and lavender at Christmas and told Miss Berry a bit about her holiday with her family. 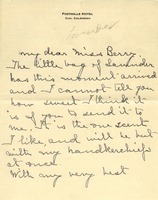 Jane sent Miss Berry a New Year card wishing for a happy holiday and a thank you for the little bag of lavender that Berry sent to Jane. Ms. Rockwood thanks Miss Berry for the bag of lavender she sent. 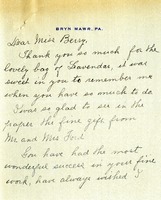 The thank you letter is to Miss Martha Berry for the gift of a bag of lavender that was received by Kate Gary. 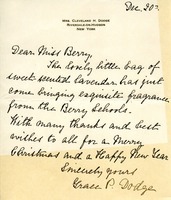 It is a scent that Gary likes and will be placed with her handkerchiefs. 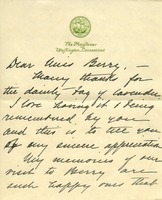 This is a brief thank you note from Mrs. Bok (written by her secretary) thanking Miss Berry for a gift of lavender.